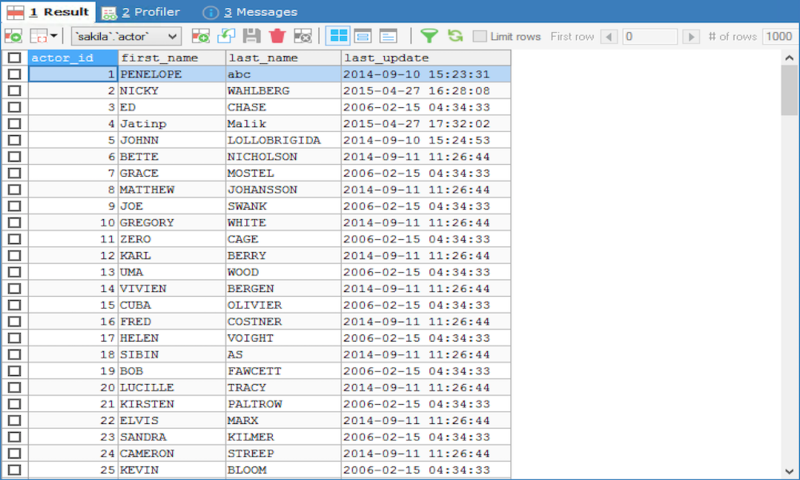 This window shows Results of Query which you can edit in an easy to use Excel like grid interface. It also shows you information about Databases and Tables and all the query(s) that has been executed in the current connection. The window has three permanent tabs - Data, Object and History and three context specific tabs - Result, Profiler and Message. Profiler tab open if the Query Profiling feature is enabled. When you execute a query that returns a resultset, a new Result Tab is added in the beginning of the tab window. If multiple queries are executed with multiple resultsets, multiple Result tabs would be created containing the resultset of the respective query. Therefore, the first tab will hold the result of the first query and second for the second query and so on. To view the results just select the respective tab. Multiple selection in the GRID is possible with Shift+Click. Note that in SQLyog, MySQL result set can be updated from the RESULT tab. However in case you use an old MySQL server version (less than 4.1) or in case you use HTTP-tunnel please read this page explaining a rare but possible risk of data corruption in such cases. Query Results may be viewed in 3modes - Grid Mode, Form mode and Text Mode. Select Edit -> Show Result/Table Data In Text (or Press Ctrl+L) to toggle between grid and text mode or between form and text mode. To switch between resultsets use the shortcut keys Alt+n where n specifies the resultset no (e.g. Alt+1, Alt+2 etc.). Also the RESULT tab can display in 'paged mode or non-paged mode' as per your settings in the Tools - Preferences - Others - Result tab pages. It works like this when the setting is ON: If user executes a SELECT query without an explicit LIMIT clause SQLyog will add a LIMIT clause to the original query so that the number of rows specified in preferences will display. Next use the arrow-buttons on top of the GRID to view more 'pages' of the result. Note that if user enters his own LIMIT clause SQLyog will never add one. For queries with subqueries is the 'outer query' that decides. In other words: automatic paging does not have effect for a query like this (as there is user-defined LIMIT in 'outer query'). To execute the same query with another (outer) LIMIT you will not need to retype the query as you may enter the new LIMIT in the textboxes above the GRID and click 'Refresh'. Note that if 'Retain query page value' is selected in preferences the last value used for LIMIT is stored and used by SQLyog next time the same query is executed against the same table (provided that paged mode is ON). When automatic paging is OFF or disabled due to a user-defined LIMIT the respective controls are 'greyed out' and disabled. You may Show/Hide Result Window through Ctrl+Shift+2 buttons. 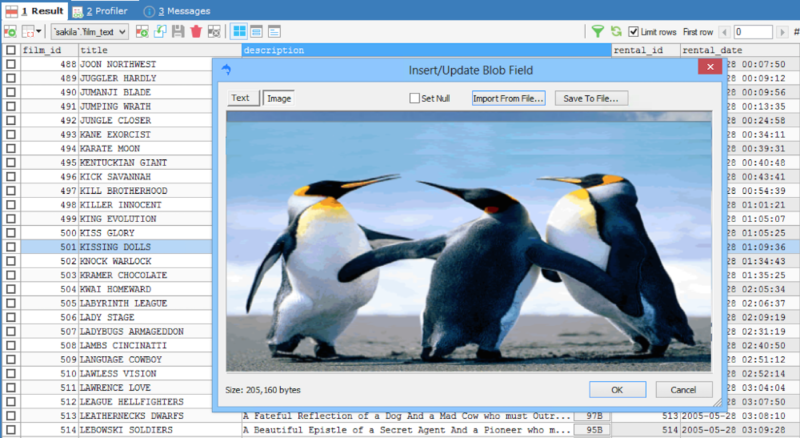 If you double click on a BLOB column, SQLyog would try to parse the BLOB data to find out whether it is a valid text/image file and then display the contents in a modeless dialog. All popular file formats like (GIF/JPEG/PNG) are supported.